I am posting over at the Country View Crafts project Blog today and I am in full summer mode, maybe it's something to do with the challenge that is running over at Country View Challenges as well, it's really motivated me to be extra summery. So here's my tempter for you and I hope you will be able to pop over and see my tag in more detail. I expect many people have children off on school holidays and are even away enjoying a break, hopefully in sunshine. Wherever you are and whatever you are doing have a great week and maybe some special creative time as well. 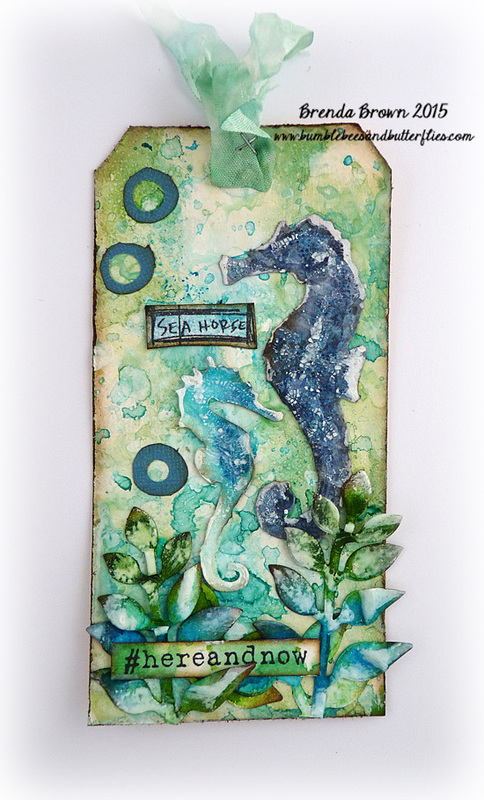 My tag today uses both the Tim Holtz nautical stamps and his mini sand and sea movers and shapers. 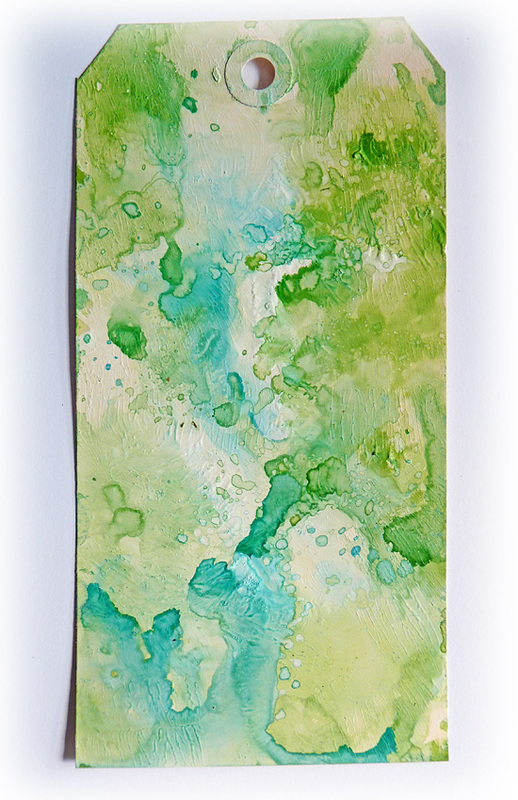 I took a tag that had been used to wipe up some gesso from a journal page and you might just see the textured impression it left behind. Over that I dipped the tag in mowed lawn and salty ocean distress sprays that were also left over from the greenery (see below). I don't like to waste anything you know. The colours were perfect for what I had in my head except I felt some white would make it more foamy for the sea so I gave the whole tag a covering of the distress micro glaze before dipping it into some watery picket fence distress paint. I got another layer creating more depth and although some of the paint stayed white, some of it mixed with the colour underneath - I guess I hadn't smoothed quite enough on in some areas. But I liked the look it produced. 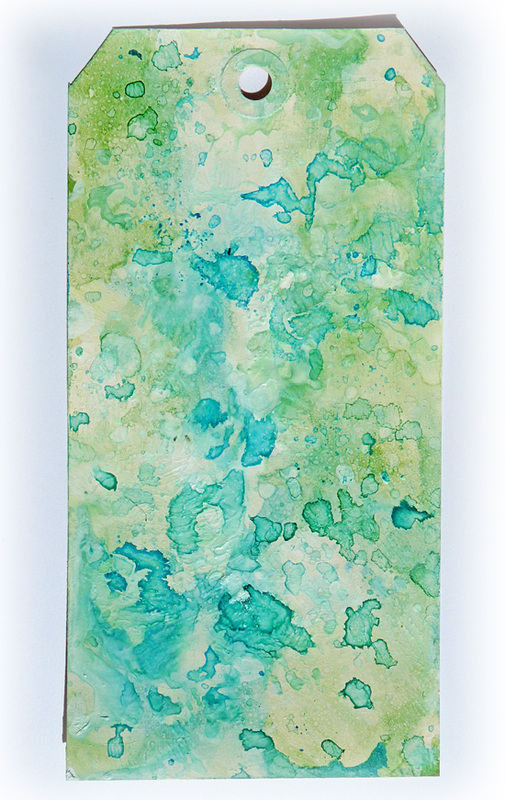 The tag looked a little too green for my liking so I now dipped it in some mermaid lagoon distress ink which created yet another layer. Next I gathered the elements together to make up the design. I had sprayed the greenery in the mowed lawn and salty ocean before dipping the tag in it (see above). 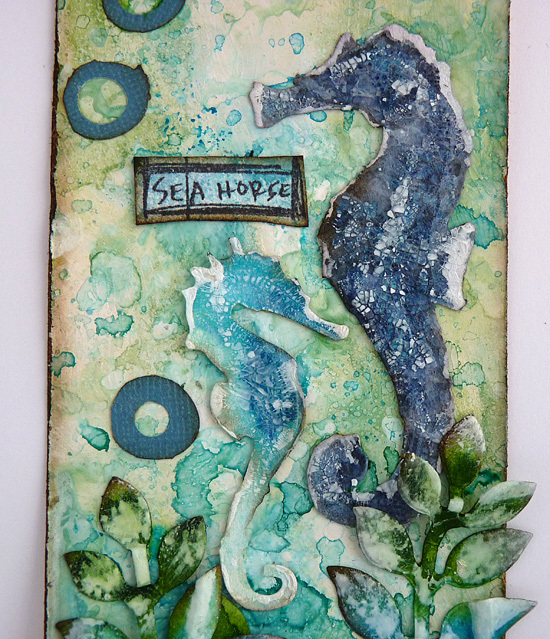 The seahorses were inked in different blues and then given a layer of rock candy crackle paint. When dry and the crackles had appeared I inked over them and gave then a splash of picket fence distress paint to make them look foamy too. Once I had finished I found the greenery far too bright in contrast with the rest of the tag so I dabbed some of the picket fence distress paint on it as well. That helped it to blend in better. I hope you are having some summer fun, thanks for taking peek at my tag today. Beautiful. Love the textures on the seahorses. Those seahorses are just amazing! Love the background and all the sea-greenery! Hugs! 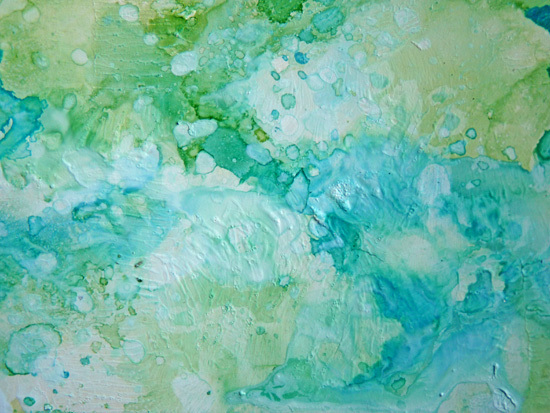 Looks exactly like the colors of the sea to me Brenda - love how you blended them together. Really wonderful. j. Of all the sea themed tags I've seen, I like this artsy foamy feel tag of yours the best!!! PINNED! Your tutorial on CVC is great too! JUST LOVE THIS!!! What a beautiful underwater scene you've made. 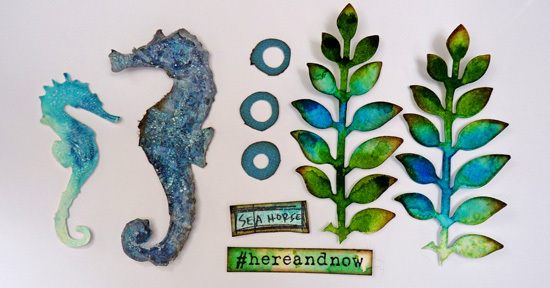 Gorgeous watery background for these sweet, crusty seahorses! this is beautiful Brenda! Love the "crusty" parts. Bravo! Lovely Brenda, off to take a closer look! Oh stunning! See it is the blues and greens for me really!! 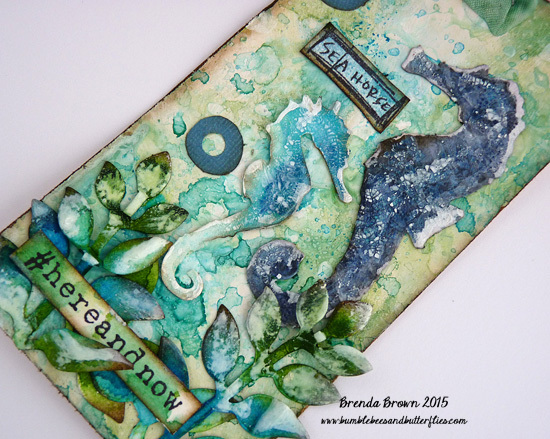 Loving the crackly seahorses and that wonderful inky background.